DAY 3 of Bluesfest 2018 in Byron Bay's Tyagarah Tea Tree Farm turned into a hippie equivalent of a Hillsong-like ministry, sans the dogma, thanks to Michael Franti. 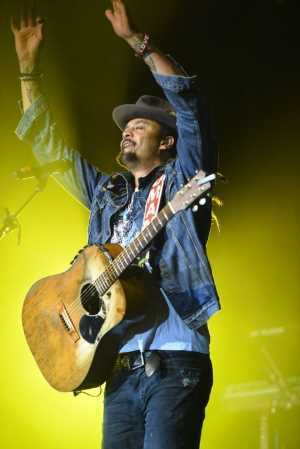 The American singer songwriter offered a show that is often compared with contemporary religious ministries, like Hillsong and others, because of the similarities with Franti's show, which features upbeat music, punters' participation, generally young fans and the positive, energetic messages delivered. Let's stop here for a second and be clear: Franti's show is not religious, but it is an energetic show charged with positive messages, reaffirmation of self value, the value of others, and ideas of respect, the need for social reformation and justice using funk, reggae, jazz, folk and rock. A veteran of Bluesfest stages (who can forget his mass yoga class during Bluesfest 2015, the most Byron Bay thing ever after a chakra re-aligment in Mullumbimby), Franti didn't just performe songs of positive messages and counter-culture: he embodied and transformed the Mojo tent into his ministry of love. Actually, a correction: Franti's show is not about counter-culture, but about humanity. In his shows Franti does not worship the human, he celebrates it. 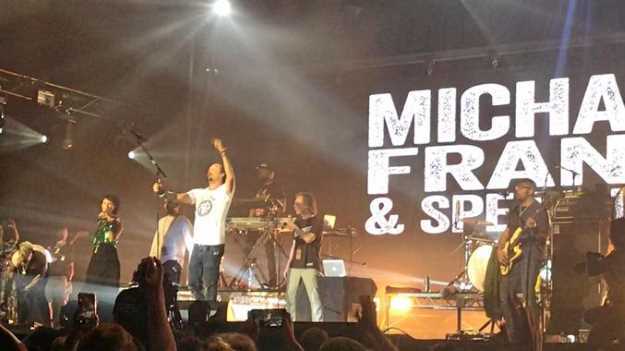 A highlight of his show last night was the sweet moment when he invited his wife, Sara Agah, who is expecting their first child and Franti's third, to sing with him, to then allow a young man to propose on stage to his girlfriend in front of thousands. By the way, she accepted. She kind of had to, but she looked truly glad to. Franti also pulled two masterpieces of crowd acceleration: he played The Wall by Pink Floyd and U2's I Still Haven't Found What I'm Looking For. At 51, Franti is full of energy and unable to stay put in one place for more than seven minutes, making him perfect to connect with audiences aged 3 to 99. He travelled into a musician's last frontier (o Franti-er? Get it? Dad joke, sorry): deep into the audience, meters away from the lights and the safety of the stage. He also had fellow musicians Jackson Browne, Juanes and Valentina Brave on stage singing with him. Celebrity spotting is becoming the official pastime of Northern Rivers residents, isn't it? We all have a story about how we saw Chris Hemsworth at the children's park in Lennox Head with his family, or something of the sort. We comment, we exchange such anecdotes almost as social currency. Well, Bluesfest is like the tax return time of such social currency. "Red alert! Jasom Momoa is backstage, according to the NITV crew," read the messages shared by reporters at Bluesfest on Snapchat, Facebook and, for those of older age, via text. 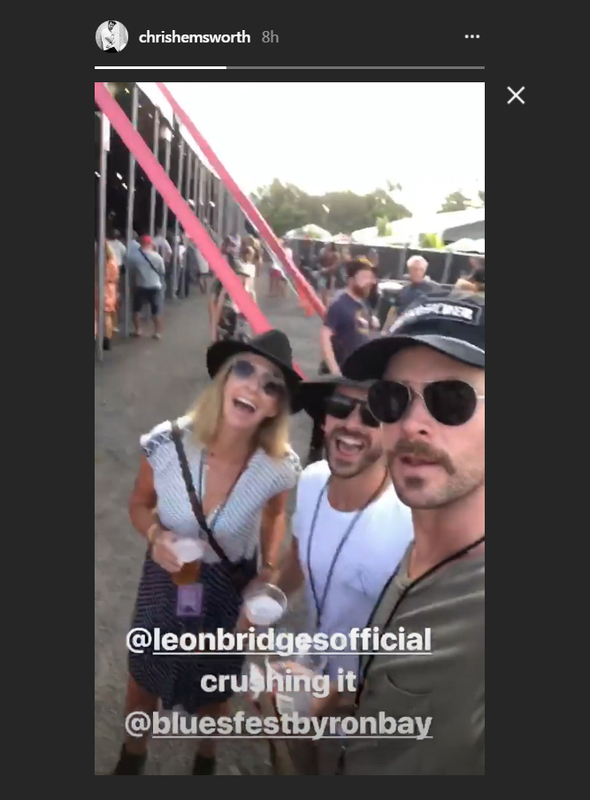 It was a day when Elsa Pataky and hubby Chris Hemsworth, plus Luciana Barroso and husband Matt Damon, confirmed that Bluesfest is the hip place to go this Easter. We did get a sense of deja-vu by spotting the same celebrities we recorded in our celebrity-watching books last year at Bluesfest but, who's complaining? Backstage, at the Gibson guitars stall, American crooner Seal sat for a guitar session and played the most chilled of tunes while chatting to the staff to everyone's amazement. And since we got to sleep an extra hour thanks to to the end of Daylight Saving Time, we'll do it all again, just a bit less sleepy.